Dancers participate in the Chinatown's 119th annual Golden Dragon Parade to celebrate the Year of the Dog, with firecrackers, dragon, floats and bands in Los Angeles, Feb. 17, 2018. Many Asian countries are celebrating the Lunar New Year, known as the Spring Festival in China, and also called the Chinese New Year. It is a national multiday holiday in many Asian countries. While it may not be a long holiday in the United States, communities are celebrating in their own way. In Los Angeles, home to one of the largest Asian populations in the U.S., festivals are held over several weekends. In downtown Los Angeles' Chinatown, people flocked to the 119th annual Golden Dragon Parade to watch the lion and dragon dance and countless floats and high school bands. "It's very important for us to celebrate Chinese New Year because of our Chinese heritage," said Lily Hui, who is originally from Hong Kong. The parade has become an annual tradition for many Los Angeles residents, including Henry Khou, who has been watching the parade since 1980. Originally from Cambodia with Chinese parents, Khou said he still follows the traditions of his ancestral homeland in the U.S.
A Mexican dancer looks at a Chico McRooster at the Chinatown's 119th annual Golden Dragon Parade to celebrate the Year of the Dog, with firecrackers, dragon dancers, floats and bands in Los Angeles, Feb. 17, 2018. "We would decorate our house with flowers [and] lights. We would do all that to give it a festive New Year's feeling, and then loved ones will celebrate with us, give red envelopes. At night, we would gather together," Khou said. "In Hong Kong, we have relatives; in L.A., we have friends. 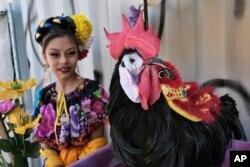 It's just a lot more culture, different types of people celebrating Chinese New Year," said Lily Hui, who was born in Hong Kong and now lives in Los Angeles. The different types of people celebrating at the parade all have an appreciation for the Chinese culture. Avery Schott, who is not Chinese, learned Mandarin in school. "It's just about bringing the family together and honoring the Chinese culture and just keeping the tradition and keeping that culture alive so that the little ones can enjoy it, and many generations to come can enjoy it," Schott said. ​Chinese exchange student Zheng Hua Liang, who has only been in the U.S. for a month, is also enjoying how Chinese New Year is being celebrated in the U.S.
"I was homesick before New Year, but when the New Year arrived, I had so much fun with my friends … this year's New Year flavor is different," Liang said. "Bringing together everybody from everywhere in the world right here in Los Angeles. I think there are few places in the world that could be able to pull this off," said Los Angeles County Sheriff Jim McDonnell, who is a part of the parade. For many families attending this parade, the hope is that their children will gain an appreciation for this annual cultural festival and continue the tradition thousands of miles away from where it originated.